We had first sighted a bullfighting ring while in Granada, Spain. It appeared out of nowhere and all four of us were stunned at its sheer size. The bullring in Granada had long closed and was now home to cafes and Michelin-starred restaurants. Fascinated we looked around the bottom tier. We walked around the entire outside trying to see what the inside looked like but all the gates were locked. So when we found out the Seville bullring was still opened, we decided to take a tour and learn about a sport that many would say is socially unexpectable in today’s age. We are going to put this out there straight away we neither approve or condone this sport. 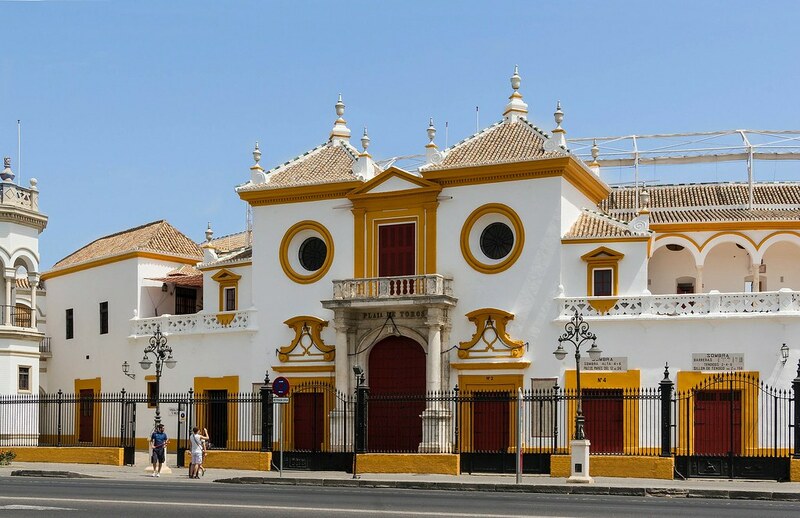 It is a part of Seville’s culture and heritage has been in operation since the mid-1700’s. We chose to take a tour of Plaza del Torres to learn more about the sport and Seville’s continued love/hate relationship with one of the most controversial sports anywhere in the world. 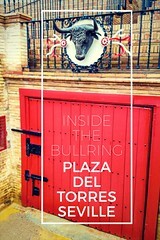 It was important for us to try and understand the history and culture of bullfighting. Yes culture its a part of Andalusia’s way of life and has played a big part in the history of this region. Bullfighting in Spain as a whole has diminished though. 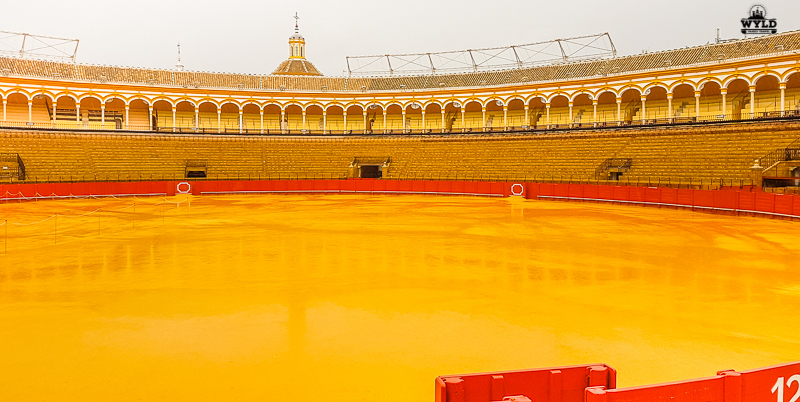 The Seville bullring offers tours in English and Spanish. We attended the 45-minute tour that takes you into the depths of the stadium. 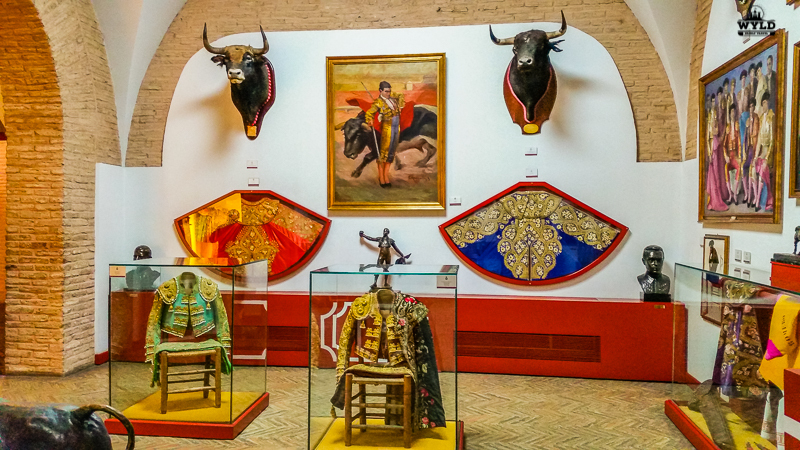 We were first able to see the museum of bull-fighting. This area showcases the history of the sport in Seville. 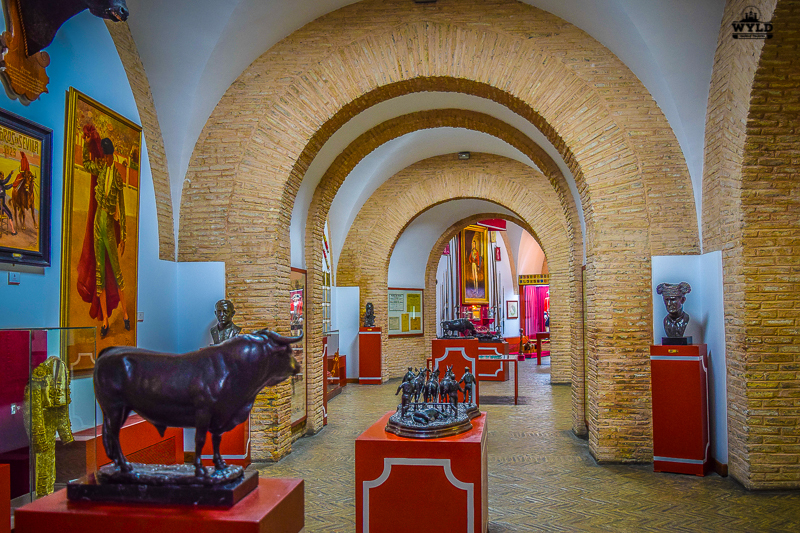 In the museum are paintings from very early bullfights. and some of the military history of the area. We were told how the stadium was built by the military. This was to stop the practice of hanging cows heads up in the street by the military to practice on. Originally this was done on horseback and was quite dangerous in the streets of Seville. This arena then gave the military a safe place to practice their spearing and aim. In the early days, any of the bulls that were killed were then given to the poor to eat as well as used by the military to feed their soldiers. 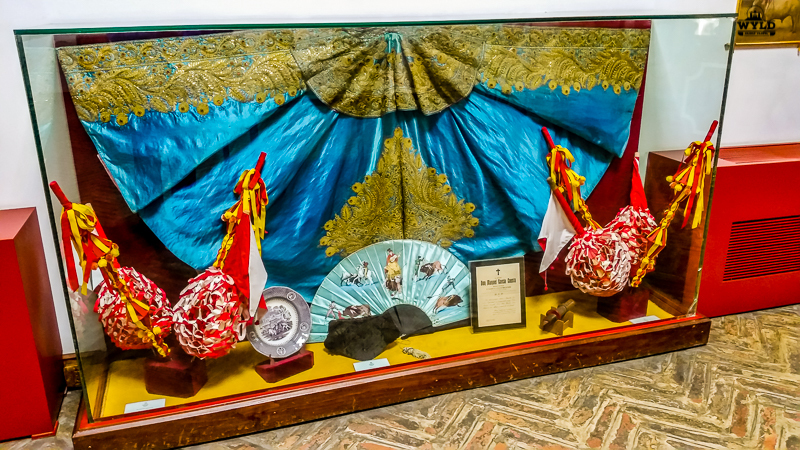 In one of the next rooms are costumes that have been donated by famous matadors after their retirement or after a famous bullfight. There are also posters that were made in the early days to promote bullfights. I was very surprised at the intricate detail that was on the matador’s costumes and how beautifully they were made. Our guide told us that the colours were picked by the matador and were just normally colours they liked. Unlike what popular culture tells us the colour red does not make bulls mad. Bulls are actually colour blind so the colour red was chosen because it stands out better to the crowd. Bullfighting can be traced back to ancient days. It was developed by the Moors in Andalucia after they invaded in 711. Over 432,000 people attend bullfighting in Seville and in Andalucia in 2016 a 4% increase. 654 Events were held During the season of 2016 across Andalucia. The bulls must be 5 years of age before they can be used in the arena. During this time the bulls are only feed oats and corn. The bulls were allowed to roam much like being free range. Some people would argue that to live to 5 far outweighs the normal lifespan of a cow. In Andalusia, there is over 150,000 hectares of land dedicated to the breeding fighting bull. The Bulls enter through this red door. The Seville bullfighting season runs for 6 months. Fighting takes place 3 or more times a week. The matador trains from a young age to be considered for the privilege of fighting in the Arena. The matador will fight 3 times during the day. Some consider the contest between man and bull more a form of artistic expression or a dance with the way the Matador moves around with his cape than an actual fight to the death. As we were learning about the Matadors our guide showed the girls a special Matadors costume. This one was from a woman who had recently retired at the age of 34. She explained that she wanted to have a family and did not think it was a good idea to continue with the sport once she had made the decision. Both the girls were surprised that women did this sport at all. That is when the questions from them started. They first wanted to know was were there many women Matadors? There were not many and the guide said there were only about 3 all up. That kept them happy for a while until we came to the preserved heads of the bulls that were on display. It was explained to us that if the fight was good the matador would get one of the bull’s ears as a keepsake of the fight. If it was a really good fight they would get both and if it was deemed extremely good then they would get then tail was well. Neither of the girls had seen a bullfight before or really even read about one and as the group headed into the next room we had to do a lot of explaining to them. Apartamentos Plaza del Salvador are located in the heart of the historic centre, 400 m from Seville Cathedral and the Giralda. They feature air conditioning, free Wi-Fi and elegant décor. These apartments are new and modern fully self-contained with cooking facilities. The apartments are close to restaurants and the Encarnación market. For more Seville, accommodation options search Here! Although we had explained to them what a bullfight was they both did not seem to comprehend the ending of the fight. Maybe we did not explain it well enough or maybe we just sugar coated it a bit too much. But we realised that we needed to do some serious explaining and we did not leave the room until they both understood what happened in the ring and the guide was brilliant helping us fill in the bits we did not know. I was thankful for her support and honesty with the girls. We were finally shown where the bulls were kept before they entered the ring. It was a large area where only 3 to 4 bulls were kept at a time. From there we saw the small chapel where the Matador’s pray before they go into the arena and then we headed out to see where it all happens, the Seville bullring. It was raining at this stage so we did not spend a lot of time our there. I was surprised at how big the stadium was and how many people could fit in there. Our guide said that during the season it is full for nearly every fight. This is where Willow asked the two questions everyone was thinking. 1. How many people have died to do this and number 2. was how many bulls have lived? Even I was impressed by her questions as the second one I had not thought of. It turns out that a Matador had died the previous season at another ring (A Matador died in the Seville bullfighting arena during the 2017 season). And to my surprise, although rare there have been only a small amount of bulls that have left the Seville bullring in retirement. They end up prize breeding bulls and live out their days in a stud farm. From there it was the end of our Seville bullring tour. Our guide was great at answering our questions and trying to explain things to the girls that we found difficult or things we did not know. 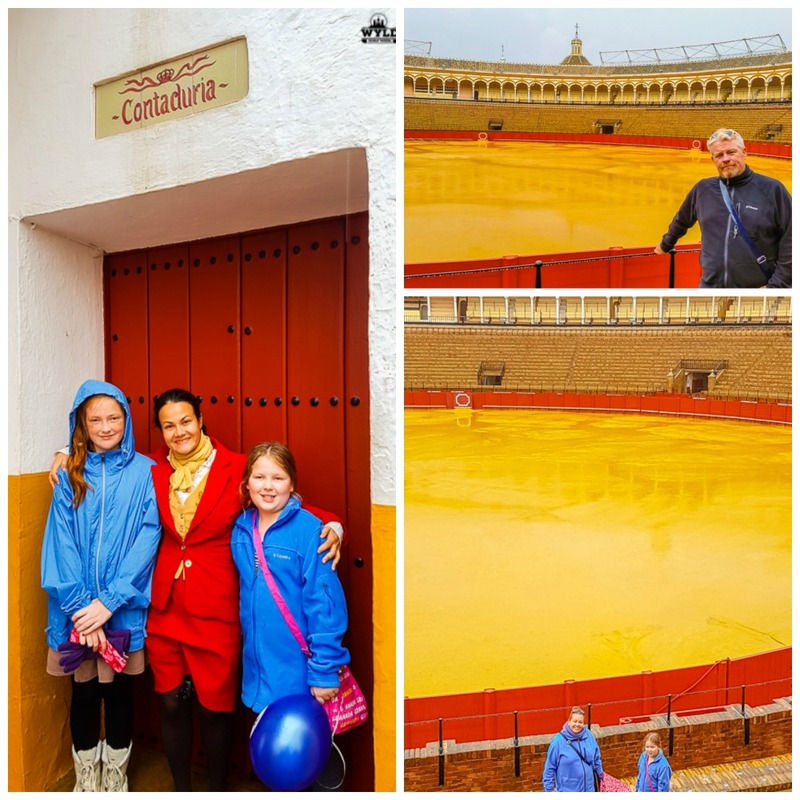 Once we had left the tour we sat with the girls and spoke with them about their thoughts on bullfighting and about the history they had learnt on the day. San Pablo Airport is located in the south of Spain, ten kilometres north-east of the Seville city centre. Pick up your hire car from Seville Airport to explore the region. For the best prices click HERE. Airport transfers to Seville and surrounding area are available. Book your transfer today. Seville has accommodation options for every budget from Hostels, to Apartments and Hotels rooms. Hostels in Seville can start from as little as $14 a night for a shared dorm room. HostelClub has a great selection of properties. Check out Trip Advisor for the top 5 ranked hostels in Seville. You can book your stay directly from this page. Here are two more articles that we have written on our time in Seville. We hope you find them interesting and helpful for your next trip to the amazing Seville, Spain. Truly interesting. My granny went on a tour and found this to be the only experience she didn’t enjoy finding it barbaric. It is sad that the bull usually dies and if not, lives the rest of his life in a stud farm. It is quite shocking that they earn ears and tails for good fights. Although the culture finds it entertaining, I find it very sad. Your post however, was very educational on the activity and the girls are so smart! I love history and clearly evident this place is rich in history. I really enjoyed the photos. One day when I am there, I will make sure to visit and enjoy the trip. That’s a pretty impressive Bullring. We visited one in Montseraz in Portugal but it was so small compare to this one. The museum looks interesting too. I don’t personally agree with this sport either. I don’t find bullfighting morally correct – though this is something new to me that bulls are blind and the red color is used because it stands out. Must have been an interesting visit, knowing about the makings of a bullfighting ring! Although I don’t like bullfighting, the arena is really impressive. 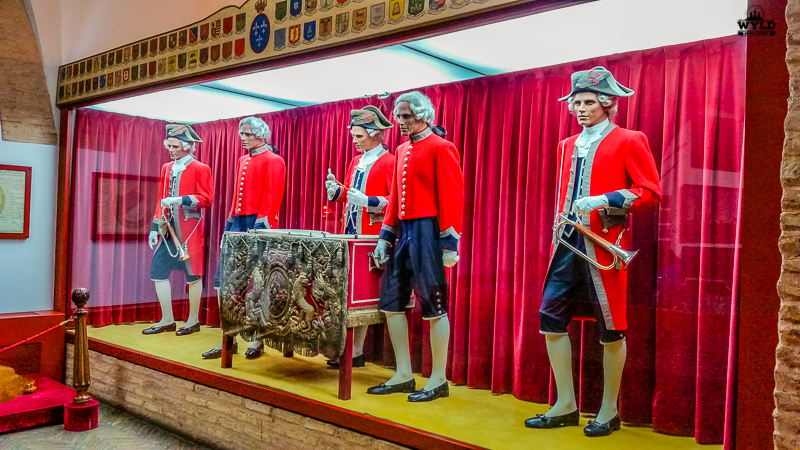 The museum is too, and the costumes are so colourful, I would definitely like to visit it. Thanks for sharing, I learned more about bullfighting. I love how you said that is neither our place to approve or support the sport of bullfighting, sometimes as travelers we can only learn about other cultures and educate ourselves and our kids. This definitely isn’t something I condone, but it’s interesting to read about the history behind it all! Do you know how most locals feel about it now? Is it still something that’s widely practiced? I am traveling to Valencia next week, I hope I would be able to visit Seville. from valencia on a road trip. Thanks for sharing this place. I loved it. Cheers.